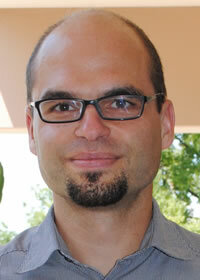 Claremont, Calif. (February 14, 2014)— Assistant Professor Lars Schmitz will discuss his ongoing research into the evolution of eyes on February 18, 2014 at the Malott Commons at Scripps College. Schmitz teaches biology at the W.M. Keck Science Department, a joint program of Pitzer, Claremont McKenna and Scripps colleges. The event is open to all students from The Claremont Colleges and begins at noon. The evolution of eyes has been one of the major innovations in the history of life. Eyes are very complex organs with multiple components and they provide a remarkable example for the evolution of intricate structures by continuous accumulation of small, gradual changes over time. In his talk, Schmitz will explore the possible role of functional constraints on the evolution and diversification of visual morphology. He will also explain how the overall shape and physiology of eyes reflect the specific properties of the environment or, more generally, the visual demands of organisms. Schmitz will discuss how ecology may influence the evolution of eye morphology in such disparate groups as birds, mammals, lizards and fish. He will address the possibility of using the linkage between form and function of the eye to make inferences about the diel activity—specifically the waking/sleeping patterns—of dinosaurs. This vein of research allows scientists to test hypotheses about morphological evolution and better understand the dynamics between physics and evolution.